Downwards movement for Tuesday’s session remains above the invalidation point on the hourly chart. A new alternate wave count is today presented for consideration. Upwards movement continues as expected. 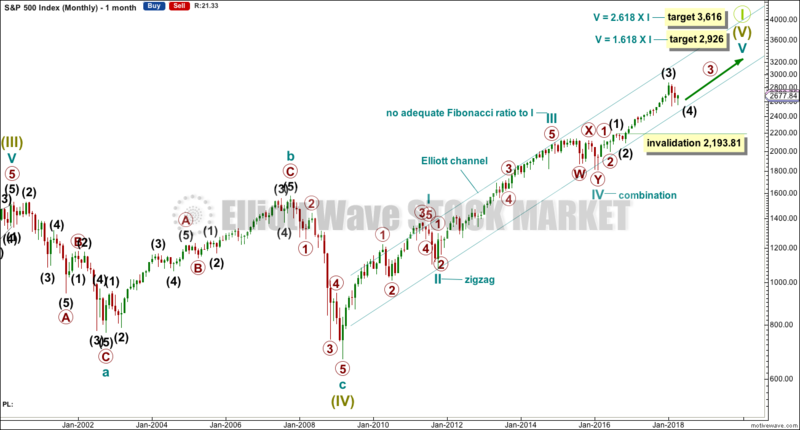 The Elliott wave target remains the same. Price has moved slightly higher, to complete an outside day, and remains within the invalidation point for the new main Elliott wave count. 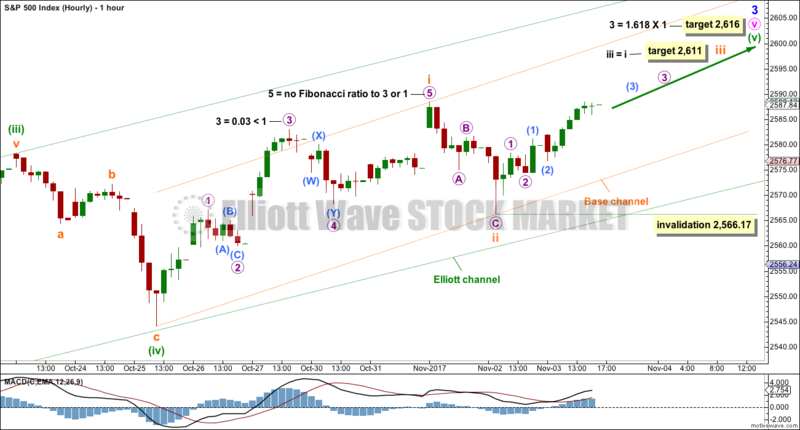 Upwards movement continues exactly as the main Elliott wave count and classic technical analysis expected. On Balance Volume continues to be very bullish. The targets remain the same. Summary: The Elliott wave target is at 2,616 and a target from a small pennant pattern is 2,617. The upwards trend has support from very bullish On Balance Volume. However, assume the trend remains the same until proven otherwise. The trend is up. Weakness at the end of this week in market breadth points to the alternate hourly Elliott wave count possibly being correct. If price breaks below the green Elliott channel on the hourly charts, then expect a multi day pullback or consolidation is underway. Pullbacks and consolidations at their conclusions offer opportunities to join the upwards trend. Always trade with stops and invest only 1-5% of equity on any one trade. This wave count has strong support from another bullish signal from On Balance Volume at the weekly chart level. While classic analysis is still very bullish for the short term, there will be corrections along the way up. Indicators are extreme and there is considerable risk to the downside still. 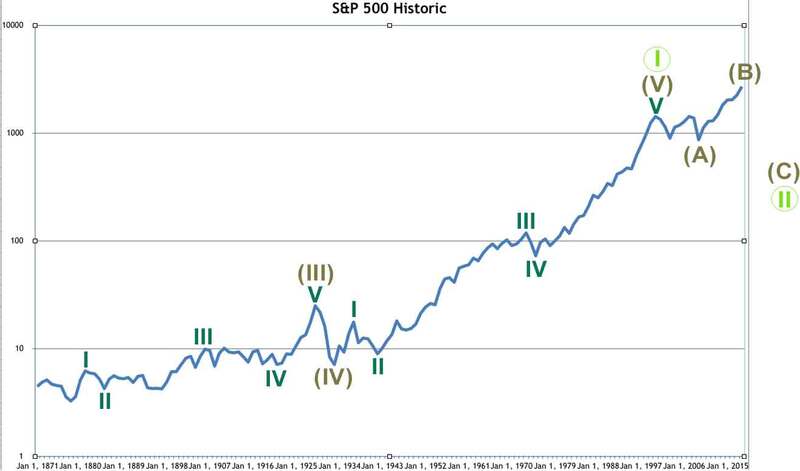 As a Grand Super Cycle wave comes to an end, weakness may develop and persist for very long periods of time (up to three years is warned as possible by Lowry’s for the end of a bull market), so weakness in volume may be viewed in that larger context. When minor wave 3 is complete, then minor wave 4 should find support about the lower edge of the best fit channel. Minor wave 4 may not move into minor wave 1 price territory below 2,299.55. The next reasonable correction should be for intermediate wave (4). When it arrives, it should last over two months in duration. The correction may be relatively shallow, a choppy overlapping consolidation, at the weekly chart level. Minute wave v is completing as an impulse. The final fifth wave of minuette wave (v) is underway. The target for minor wave 3 expects to see the most common Fibonacci ratio to minor wave 1. 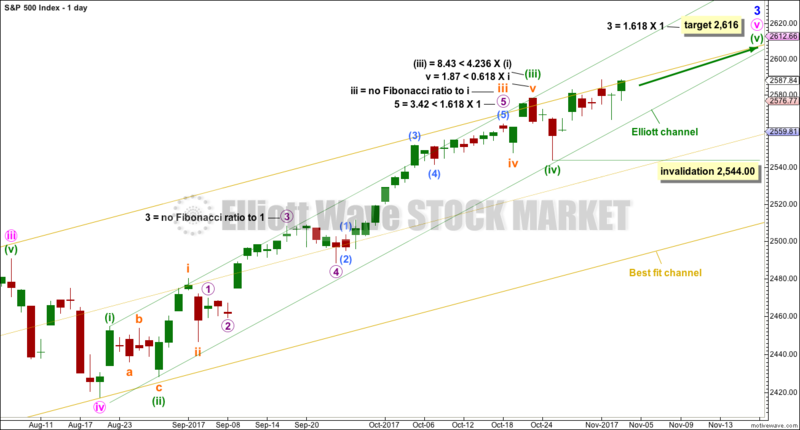 Within minuette wave (v), no second wave correction may move beyond the start of the first wave below 2,544.00. Assume the trend remains the same until proven otherwise. Assume the trend remains up while price remains within the green channel and above 2,544. 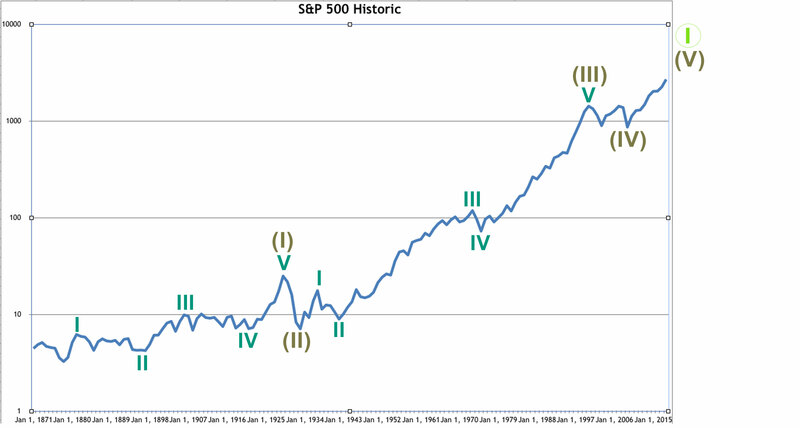 Minuette wave (v) must subdivide as a five wave structure. It may be an impulse with subminuette waves i and ii complete. 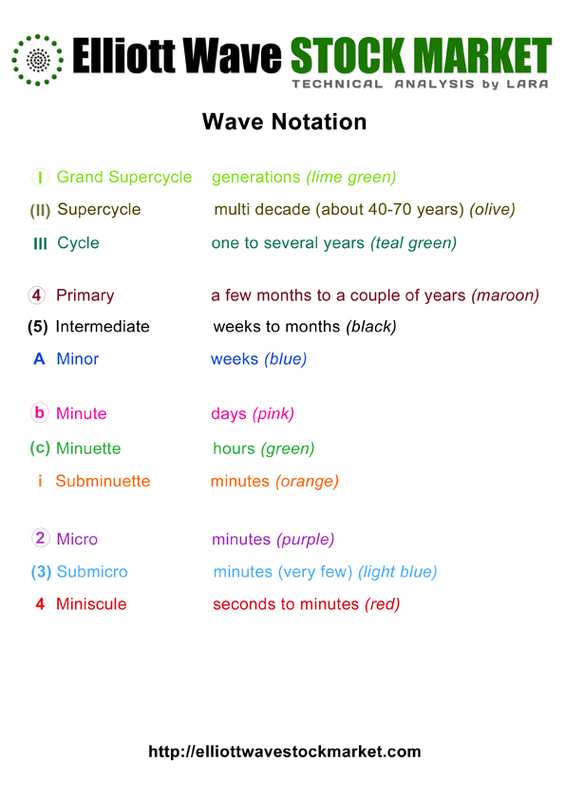 Subminuette wave ii now looks like a completed three wave zigzag. 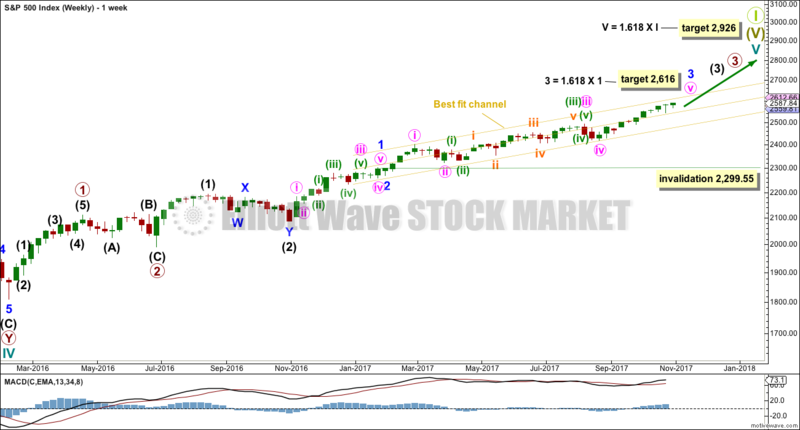 This wave count expects to see a further increase in upwards momentum as a small third wave up unfolds. Within subminuette wave iii, no second wave correction may move beyond its start below 2,566.17. A breach of the green channel by downwards movement would be the earliest indication that this first wave count may not be correct. If that happens, then seriously consider the alternate hourly wave count below. This alternate simply moves the degree of labelling within the last five up all up one degree. It is possible again that minor wave 3 could be over. Minor wave 2 was a quick shallow 0.16 zigzag lasting just three days. Minor wave 4 should also show up at the daily chart level. It may be a sideways consolidation, subdividing as a flat, combination or triangle, to exhibit alternation with the zigzag of minor wave 2. These structures are often more time consuming than zigzags. So far minor wave 4 may have lasted five days and the structure would be incomplete. It may end in a total Fibonacci eight or possibly even thirteen days. A new correction at minor degree should begin with a five down at the hourly chart level. This has not happened, a three down only is complete. The probability of this wave count is reduced. It is possible that minor wave 4 is beginning with a flat correction for minute wave a. Within the flat, minuette wave (b) has passed the minimum 0.9 length of minuette wave (a). 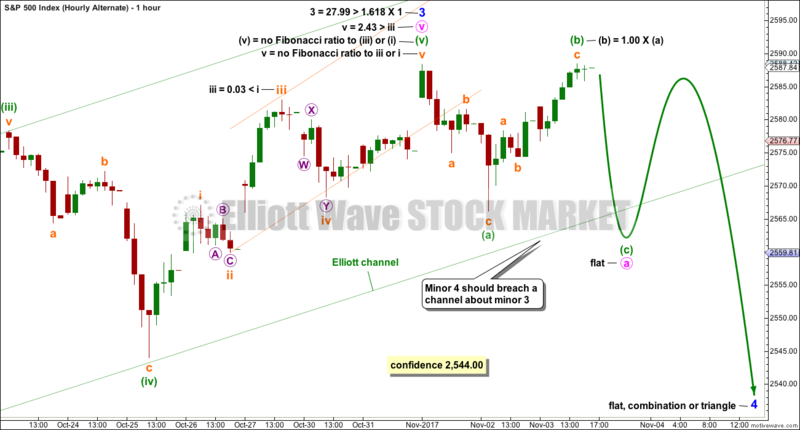 Minuette wave (b) may continue higher above the start of minuette wave (a) at 2,588.40 as in an expanded flat. Upwards movement during Thursday’s session has some reasonable support from volume. This reduces the probability of this alternate wave count; B waves should exhibit weakness, not strength. The Hanging Man candlestick requires bearish confirmation because the long lower wick has a strong bullish implication. This week has not given bearish confirmation, so the Hanging Man candlestick should not be read as a reversal signal. 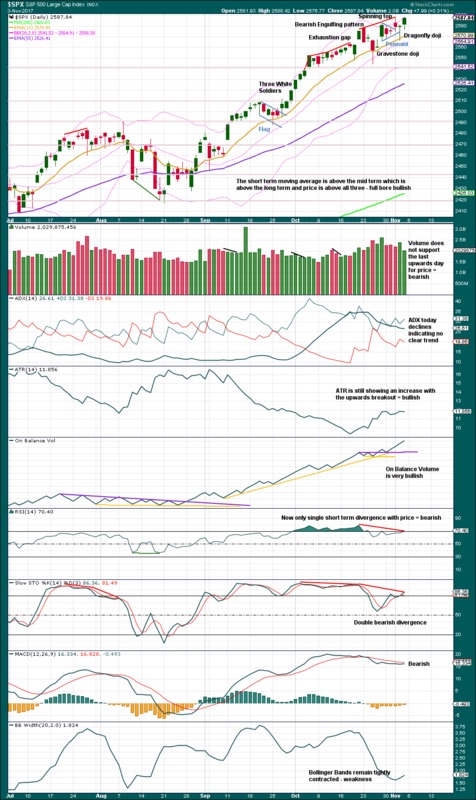 Indicators are now extreme, but at this stage there is not enough weakness in price to indicate an end to the upward trend here. 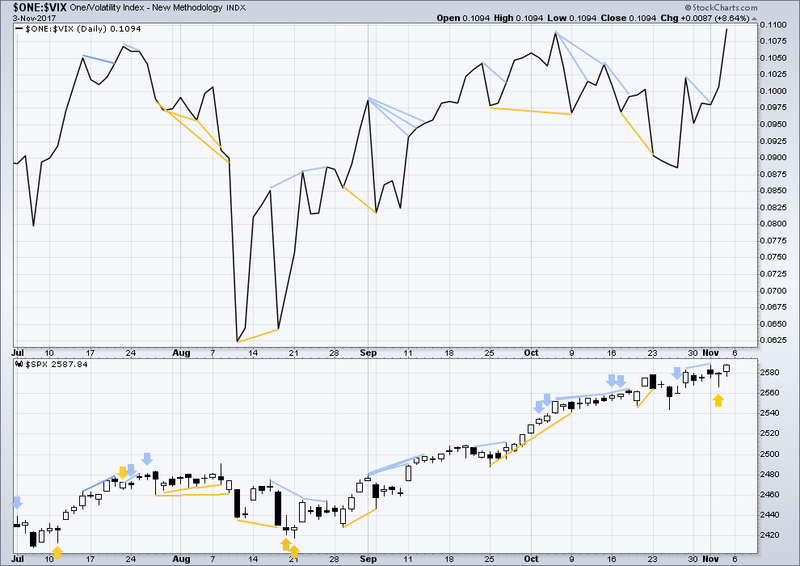 Extreme conditions for ADX and RSI may persist for several weeks while price continues higher. 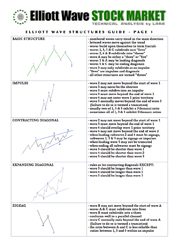 Pennants are one of the most reliable continuation patterns. The measured rule calculates a target about 2,617. Because this is only one point off the Elliott wave target, this area may offer strong resistance. On Balance Volume remains very bullish. Volume today shows some decline, but this can persist for reasonable periods of time in current market conditions while price may continue to rise. On its own, this decline in volume signals a warning of weakness, but it will not be useful in timing an end to this upwards movement. 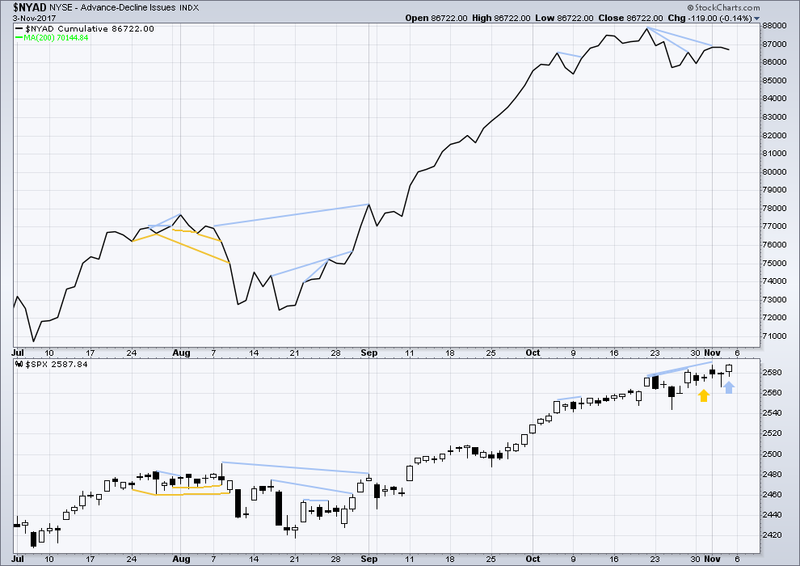 There is less weakness evident today as double divergence between price and RSI now becomes only single divergence. This divergence indicates some weakness here in price, but again it will not be useful as a timing tool to show when price has found a high. On Balance Volume will be given the most weight in this analysis because it remains one of the most reliable indicators in current market conditions. Bullish divergence noted in last analysis has now been followed by an upwards day to a new all time high for price. This divergence may now be resolved or it may need one more upwards day to resolve it. There is no new divergence today. Both price and inverted VIX have made new all time highs. The rise in price today has come with a normal corresponding decline in volatility. This is bullish. 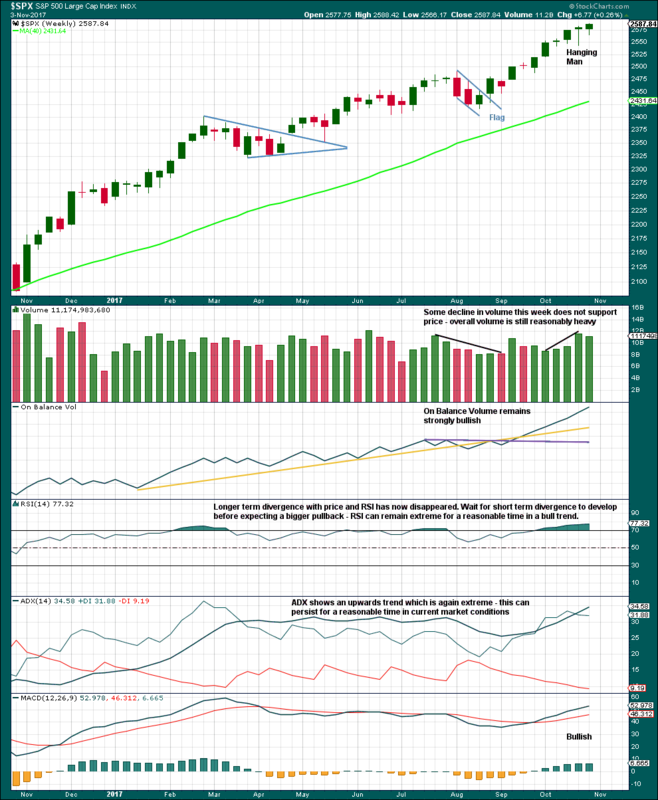 There is new bearish divergence today between price and the AD line: price has moved higher to make a new all time high, but the AD line has moved lower for the session. The rise in price did not have support from rising market breadth, so this divergence is bearish and points to a red daily candlestick for Monday and / or Tuesday. Small caps have moved lower during this week failing to make new all time highs. Mid caps made their last all time high on Wednesday and have failed to make a new all time high for Friday. There is some very short term weakness within this market developing. At the end of this week, only DJT has failed to make a new all time high. The S&P500, DJIA and Nasdaq have made new all time highs. DJT has failed so far to confirm an ongoing bull market. Failure to confirm an ongoing bull market should absolutely not be read as the end of a bull market. For that, Dow Theory would have to confirm new lows. Published @ 06:12 p.m. EST. Upwards movement was expected to continue from last analysis, which is what has happened. The short and long term targets remain the same.